There are three main types of wood flooring – Solid wood flooring, laminate wood flooring and engineered wooden flooring. The different types is determined by the structure of the boards. 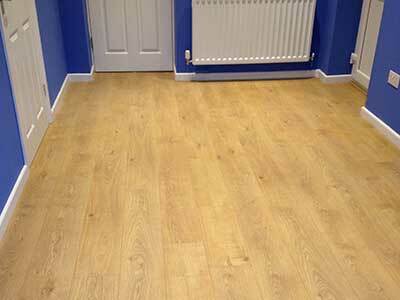 Solid Wood Flooring is made from one continuous piece of timber. No other manufacturing process apart from the drying and cutting of the wood is involved. Good quality solid wood flooring is usually between 18mm and 22mm thick and solid wood can be manufactured into different Styles like strips, boards, planks and blocks in a great variety of lengths and widths. Price – all depend on the type of wood you desire, Oak is generally the most expensive on the market. Style – strips, boards, wide planks or blocks to enhance your home. Width – from narrow 57mm to very wide in excess of 200mm to suit the size and shape of the area where the floor is to be installed. Engineered Wood Flooring is becoming more popular. A good quality Engineered board would invariably be 21mm thick and has a multilayer construction – Base which is made of 3 to 12 perpendicularly running sheets of soft wood for stability and a solid top 5/6mm layer called Lamella glued onto the base. Price – all depend on the type of wood you desire – Prices can vary dramatically. Style – Engineered boards most often come in planks. Parquet blocks and panels are increasingly made from Engineered as it provides better stability, so you would just need to choose which is most suitable for your home. Width – varying widths starting usually from about 100mm up to 260mm wide, to suit the size and shape of the area where the floor is to be installed. We can also remove the existing floor coverings, if need be, we are able to supply and fit your chosen wood flooring or we can project manage the whole job from start to finish. Our work is of a high standard leaving the project completely finished to perfection, We can remove or undercut the skirting boards and plain the doors to leave the required effect. "Absolutely love our finished kitchen. The attention to detail made sure that we were left with exactly what we had planned." "We had the hallway & 2 rooms wood floored, also 3 new doors hung, the transformation is amazing."